No, this is not a tribute to Brittney Spears. It's me confessing to you that I've started yet another challenge. It's called the One Room Challenge (ORC). 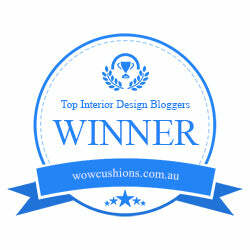 Twice a year 20 pre-selected interior bloggers choose one room for a total makeover. They are given 6 weeks to complete the entire project. During this 6-week period, we follow as they show us their room transformations. Additionally, all blogger guest participants - that's where I fit in - follow along and document their own progress in a blog post. Each Thursday, we all link to one main page, which will be viewed by many observers, top name designers, and home & garden industry influencers. I'm just glutton for punishment, I know. But after having finished my 14-week Whole House Challenge (WHO), I feel as if I've been in training for this. But one can never be too confident. Although it is not a competition, with big names like House Beautiful, House & Home, All Modern, Houzz, and Southern Living watching, I want to do my absolute best. What Room Did I Choose for this Challenge? If you haven't already guessed from the title, the room I've chosen to makeover is our back yard deck. Summer months seem to start late and end early in the Midwest. So as soon as the weather breaks, we head out back for barbecues, cocktail parties, bean bags toss games, and of course lots of line dancing. But our deck has always seemed to be an after-thought. Last year my husband painted it a two-toned color, which seemed to liven it up a bit. Yet, there's still something missing. My aim will be to make it an extension of our home. Since my husband is the official Yard Boss man, (seriously, that's the name of his lawn care and maintenance business) of course he was on board with the idea. Yes!!! Without further adieu, below are photos of the space we'll be transforming. Needless to say, we have a lot of work ahead of us. And yes, those are tree stumps. For reasons that only God knows, my husband keeps bringing them home from his job sites. I still haven't figured out how or if I will incorporate them in the final design. But I do know that they will have to either go, or be transformed. Any ideas on how I could use them? There are so many ideas running through my mind right now. But I have to stick to a reasonable budget, while trying to pull off a high-end look at the same time. So I've been scouring my files like crazy, looking for inspiration to create this outdoor oasis. Awww, I thought you'd never ask. Please support me. Encourage me. And share your honest opinions on my progress. Just be kind. We creatives are sensitive about our work. K? The other thing you can do is comment, like and share my posts with others. There are two buttons for Facebook and Twitter at the end of this post. I can also be found and followed on Pinterest and Instagram (see the pink sidebar on the left-hand side of this page). All it takes is a click. Merci! Finally, visit some of the other bloggers in the line up. As you may have noticed during my WHO Challenge, designing/organizing/decorating a room while blogging about it at the same time is super tough. For ease, I'll try to link my favorites here in a future post. I have about a week to decide how I'm going to tackle this space. Feel free to check back here every Thursday for updates. Next week, I'll reveal my plan. Stay tuned... and as always thank you for visiting me at my little "idea boutique".